For those without comedic tastes, the so-called experts at Wikipedia have an article about Boston Tea Party. 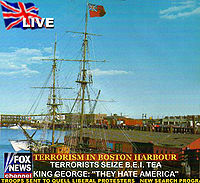 Fox News offering their 'fair and balanced' view of the situation in Boston Harbour. The Boston Tea Party is unique amongst violent revolutionary acts in having a really girly name. When the Bolsheviks stormed the Winter Palace, they didn't call it "Mrs. Lenin's Soiree", did they? 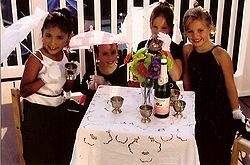 When the French beheaded Louis XVI they didn't call it "The Paris Sleepover", and they were French, so they had an excuse for acting like teenage schoolgirls. The Boston Tea Party was obviously held in Pearl Harbor, a large bay in California. Thomas Jefferson (left) and Benjamin Franklin (right) at the Boston Tea Party. The colonists formed a to organize the party. The congress consisted of Thomas Jefferson, Benjamin Franklin,and Gomez Addams as well as George Washington Carver and his evil twin Benedict Arnold Carver. 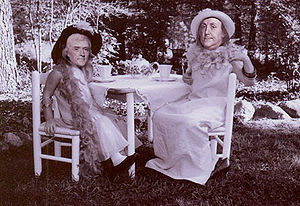 Whilst the others were organising the teacakes and cucumber sandwiches, Jefferson was left in charge of making the tea. The others advised Earl Grey tea but Jefferson declared himself far too independent to take their advice and ordered Chai tea instead. Since all right thinking people hate and despise Chai tea, the colonists had one sip of Jefferson's tea (one sip each, obviously) and began rioting furiously. An alternative theory is that Jefferson, Franklin and others were attempting to set a Guiness World Record for the world's largest cup of tea, by dumping the tea directly into Boston harbour. The results, however, were far too weak, cold and salty to be considered an acceptable cup of tea, and the Guiness Record Book officials declined to approve the record for inclusion. The disappointed participants responded with violence. King George thought that this rioting was a revolutionary act, and responded by having Tom Scholz, Brad Delp, Barry Goudreau, Sib Hashian, and Fran Sheehan hanged by the neck until dead. This was known as the Boston Massacre. In order to explain this butchery to the public, King George had his brothers (who were, oddly enough, a rare species of orangutan) all dress up as tea and throw Indians into the harbor. When this didn't work, King George himself tried a couple different methods. In one, he dressed up as a harbor and threw tea into the Indians. When nothing seemed to work, he declared himself legally dead and shipped himself to Zimbabwe. His brothers moved from Boston all the way to what we now call Canada. They are currently the only occupants. Meanwhile, sometime around the Boston Massacre, and at the time of King George's plans to overthrow the party, the French were devising a silly plan to thwart this tea party, the french, always wanting to be silly and ridiculous, thought of a plan in which they would come to the party with underwear on their heads while doing the macarena, thus showing americans they were the most comedic and wimpy of all nations, Napoelean Bonaparte, evil alien french leader and tinyman extrodinaire divised this particular evil plan, so the french came to the party (including bonaparte) and did their plan as intended, but at the same exact time of their tom foolery, tea was being dumped into the river by rebels of the US who were apparently commies. the americans were scared out of their wits and began drinking the lake, the french seeing this was more silly than doing the macarena with underwear on their heads, got ashamed of their country, France, because apparently they werent' the silliest anymore, it was now the americans who became the most silly. Napolean and his men joined the US rebel "commies" and the rebels helped the French rise again to become the most silly, failing to do so, all they could do consequently was coin the terms "gosh", "tina you fat lard", and "freakin' idiot", which the americans adapted into the feature film Napolean dynamite, replacing Dynamite with Bonaparte, Thus to this day becoming a government conspiracy... and the French, in their own way, never thought themselves to be silly since that one fateful day, at the Boston Tea party followed up by the equally hilarious Boston Massacre. Incensed by the deaths of their favorite band, the people of the coloniesiesies turned as one to face George III and glowered at him until he got embarrassed and went away. Free from George's oppression the Americans held the War of 1812, but no one noticed. The Boston Tea Party was also responsible for the birth of the Liberal media conspiracy.